Percy Jackson meets Norse mythology in this captivating and unique adventure. Alane Adams weaves a rollicking tale of adventure, filled with magic and mayhem, in The Red Sun, first in the Legends of Orkney series. Adams combines elements of Norse mythology and Umatilla tradition to send her young protagonist, Sam, on a unique quest to find himself and to save the entire realm of Orkney in the process. For Sam Baron, starting seventh grade involves more than just mastering geometry and talking to girls in the quiet town of Pilot Rock, Oregon. His entire world turns upside down when a witch arrives in the guise of a substitute teacher and focuses her questionable attention on Sam. Sam is shocked to learn that not only do other realms exist, but thanks to his absentee father, he is “a Son of Odin, Lord of the Ninth Realm,” and thanks to his casserole-baking mother, he is a powerful witch. Orkney, the land of Sam’s birth, has been cursed, and mysterious red veins are slowly poisoning the sun and everything under it. The elves, dwarfs, witches, and other citizens of Orkney hold Sam responsible, both for triggering the curse and for ending it. Sam must find the courage and strength to embrace his legacy before it’s too late. Sam considers himself an average twelve-year-old, maybe with a bit more temper than most. He wavers between feeling unworthy of the tasks set before him and proud to the point of foolhardiness of his newfound powers and identity. His decision-making skills are iffy, and emotions run high. Sam has moments of sweetness, particularly in his brotherly banter and attitude toward Mavery, an orphaned witch, but his temper, the unfortunate result of a sting from a death stalker scorpion, too often takes shape in the form of fighting, verbally lashing out, and rash behavior. Although he tries to overcome it, his friends and allies often bear the brunt of his anger, making it difficult at times to like him. Sometimes he apologizes, sometimes not; for instance, Sam confronts his friend Keely: “when she grabbed my arm to stop me from walking away, I pushed her hard enough to knock her to the ground. I stared down at her hurt face, feeling the blood pound in my head. ‘Leave me alone!’ I yelled and then stormed off.” Young teens may relate to the roller coaster of emotions that plague Sam, and the idea of falling short of expectations but rising up to try again. Adams incorporates a unique mix of well-known and obscure myths and legends, all entwined in the land and realms of Orkney. Many of the terms, names, and concepts would work well in a glossary; it is not always clear if a character is Norse, Umatilla, or completely original. The Norse mythology is spotty. Odin, for example, is depicted with two clear eyes and a toga instead of his traditional garb and missing eye. The result is engaging and fresh but frustrating for Norse/Scandinavian folklore buffs looking for accuracy over innovation. 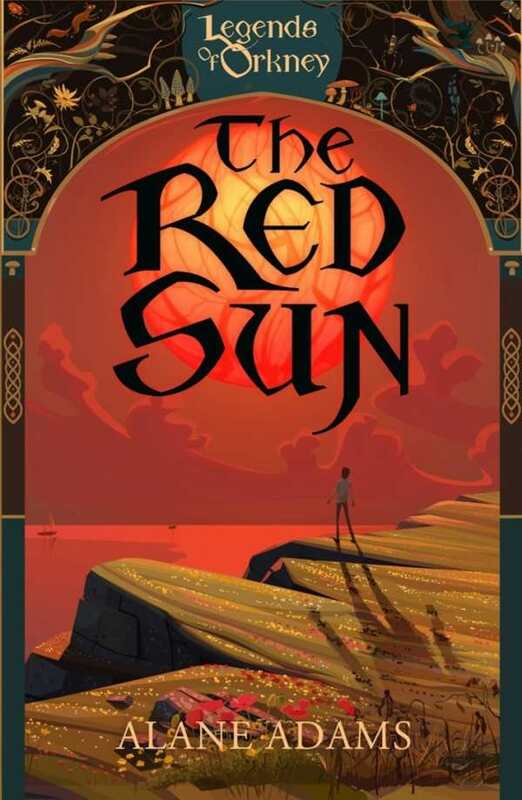 The Red Sun is a great choice for teens and young readers who enjoy lots of action and a healthy dose of fantasy mixed in with substitute teachers and pop quizzes. Comparable at times to Gregor the Overlander or the Percy Jackson series, Sam Baron’s adventures will continue with book two, The Moon Pearl.